We lived in a log cabin in the ponderosa pine forest of Prescott, Arizona. 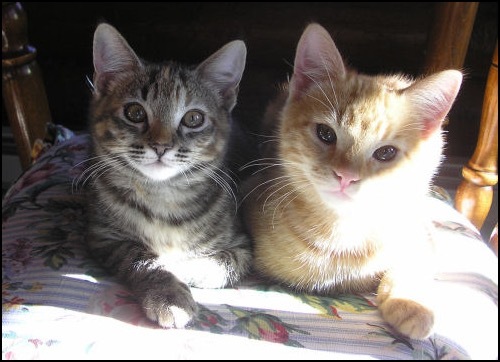 I let Lila and Jerry outside during the day after they were spayed and neutered at about six-months old. They loved being outdoors and mainly stayed in our large fenced yard. Then, as cats will, they wandered further. 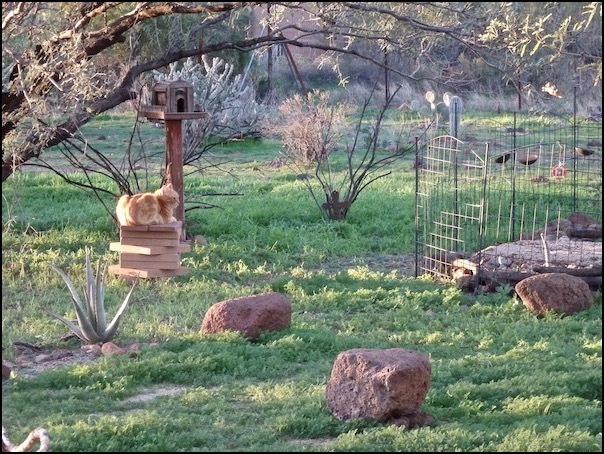 The biggest danger to the cats in the area was not coyotes but feral cats. Lila came home one day with a wound in her back leg requiring veterinary attention. She showed me she had met a feral cat and realized too late that the cat was not friendly. When she ran, the cat attacked from behind. I kept the cats indoors after that, except for Ollie (orange tabby who arrived in late January 2010), who always stayed in the yard and came in when called. Jerry was very angry at me for confining him. To help him be outdoors safely, I had a cat enclosure built, leading from the garden window. Lila and Ziggy (black cat who came in May 2011) loved it. Jerry appreciated my efforts to help him and stopped being angry with me but still was frustrated. I then spent many hours building wire cat tubes suspended in the surrounding pine trees and circling back to the enclosure. All the cats had fun in them. Jerry still wanted to go out in the wild world. He began to express his frustration by beating up on Lila and Ollie. He was resentful that Ollie got to go out, and one day Jerry gave Ollie a deep puncture wound on his back. I was mad at Jerry when I let him go out the next morning. Ollie needed peace and quiet after veterinary treatment to make sure the wound didn’t get re-infected. Lila and Ziggy sat with Ollie while Jerry was gone and offered him paws-on healing. It helped a lot to release the trauma. Jerry disappeared for 5 days. I kept in touch with him, but he went far into the surrounding national forest. I detached from Jerry’s fate and thought I might never see him again and we’d be quite happy with our cat family of three. On the day Jerry left, there were tracks in the yard, like a mountain lion’s big round pug marks, but they disappeared after a short run on the patio and path. Perhaps a mountain lion spirit had taken wild Jerry with him. On the sixth day, Belinda (dog) and I were taking a walk and I heard a familiar meow. 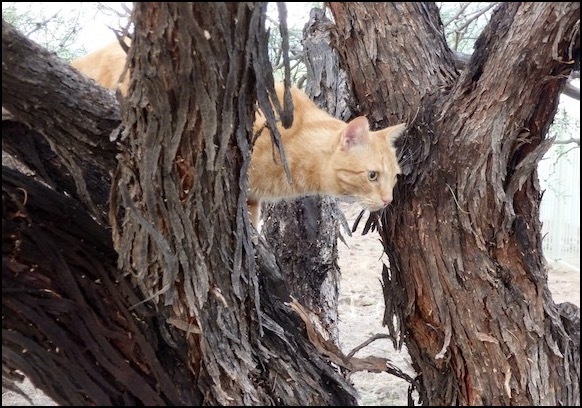 Just 500 feet from home, I found Jerry about 40 feet up a pine tree with a large orange tabby at the base of the tree, who ran when we approached. Jerry called loudly non-stop. Some of the neighbors came out, figuring a cat was in deep distress. One neighbor tried to help by going up a long ladder, but it reached only half-way to Jerry’s perch, and Jerry made no attempt to come down. I took Belinda home and came back with a cat carrier. There were no branches below Jerry and he was scared to shimmy down the long trunk. The sun had set and there was nothing else I could do. My plan for the next morning was to ask a man with a crane/chair lift who had been working in the area putting up new poles for the electric company to help with getting Jerry down. It was well below freezing that night, as it had been on the other nights Jerry was away. As soon as the man with the chairlift truck arrived in the morning about 8 AM, I asked for his help. When Jerry saw me, he began yowling at the top of his lungs. Fortunately, there was space to move the truck toward Jerry’s tree. I asked the man to stretch the cat carrier toward Jerry so that Jerry would go in it or climb down away from it. The man hoped Jerry wouldn’t jump from 40 feet, as he’d seen other cats do that and get hurt. When the man rose up on the chair lift, Jerry slid down the tree about 25 feet, jumped the rest of the way, landed in a bush, and ran toward home. Jerry was hungry, thirsty, had a cold, and had lost 2 pounds in 6 days. He said he was tired of other cats chasing him out of their territories and was on his way home when he was chased up a tree. He recovered quickly and appreciated as never before how much we all loved him. However, his need to be free did not subside. I wished he didn’t go out of the yard, but at least he was savvy of the dangers, and he did stay home at night. A few years later, Jerry had a serious run-in with a feral cat and came home with his face swollen like a melon and eyes almost closed. The vet diagnosed a cellulitis infection. While Jerry healed quickly with antibiotics, I just could not let him run free after that. Jerry was stressed and began to overgroom his back and pull his hair out. He also started seriously attacking Ziggy and Lila. For their sake, I moved him to the guest cottage to live by himself, visiting him for meals and play. In March 2015, we moved to New River, a rural area north of Phoenix, Arizona with 5 acres of gorgeous Sonoran Desert land. After living in the cottage for 3 months, he got what he wanted most of all, to roam outside. I warned the cats about the dangers of coyotes, bobcats, mountain lions, and rattlesnakes and required them to come in before dark for dinner. Despite these wild predators, the environment felt safer than the feral cat danger in our Prescott pine forest home. Jerry went from acting like a bully to feeling free, alive, and getting along with everyone. He loved the adventure and freedom he felt. He stopped pulling his hair out except when I closed the cat door due to the presence of a rattlesnake or he got frustrated because he couldn’t go out at night. Occasionally Jerry would stay out past curfew and come home late at night or the next morning, always contented and uninjured. Despite his independent nature, Jerry expressed deep affection in rubbing and purring sessions with me, friends who would visit, and his dearly beloved dog friend, Belinda. When elderly Belinda’s health was declining, I was concerned how her death would affect Jerry. One day, while Belinda, Jerry, and I were resting in the afternoon, Jerry looked me in the eyes and told me he’d take care of me after Belinda had gone. I was touched. On November 1, 2018, after I came home from the vet with Belinda’s lifeless form, both Lila and Jerry chose to stay inside and were very attentive to me. They participated in the burial ceremony (November 21, 2018 blog), and in the days that followed, Lila followed Belinda’s routine of looking after me and Jerry was also much more devoted. Jerry needed quiet and I saw him lying near Belinda’s grave several times, contemplating and mourning. Although I thoroughly washed the dog bed that Belinda had died in, Jerry would go over to it, push his nose into the seams, and inhale deeply with a satisfied but melancholy air. Needing comfort, he plopped his body firmly against mine on the bed at nap time. He began to stay out overnight more frequently than before. He said he needed to rebalance himself. At the beginning of December, as he was being very affectionate on my lap, Jerry surprised me when he said, "Maybe we can get another little dog." I told him I wasn't feeling ready yet. Jerry went out on December 9 and did not come back that night. At about 9 AM on December 10, I heard coyotes singing toward the tree-filled back of our large property. I feared they had gotten Jerry, but dismissed it as just fear, which I had whenever Jerry is not back on time. That day, I saw Lila going outside the fence, looking around, and glancing behind her cautiously with her tail puffed out, as if there might be coyotes. Ziggy even ventured further in the yard than was usual for him, also looking around. On December 11, I let the realization sink in that Jerry was gone, that coyotes had gotten him. Lila told me that she had looked for him in all his regular places, and he wasn’t there. She said she knew he had been killed. I kept Lila and Ziggy indoors after that with access just to the cat enclosure. They understood. My aching heart felt very heavy. I remembered how Jerry had been sometimes sad, moody, and restless since Belinda died. I saw images of three coyotes circling Jerry when he was resting. He was exhausted from being out for so long with no sleep, sad, and feeling like he had no purpose in living anymore. After always having been so alert to avoid them before, now he let the coyotes end his life. I took the wind spinner of an orange tabby cat on a bicycle from the chicken run and placed it near Belinda’s grave. It always reminded me of Jerry. The cat on the bicycle pointed itself north, toward the wild zone, the direction where Jerry left his body. 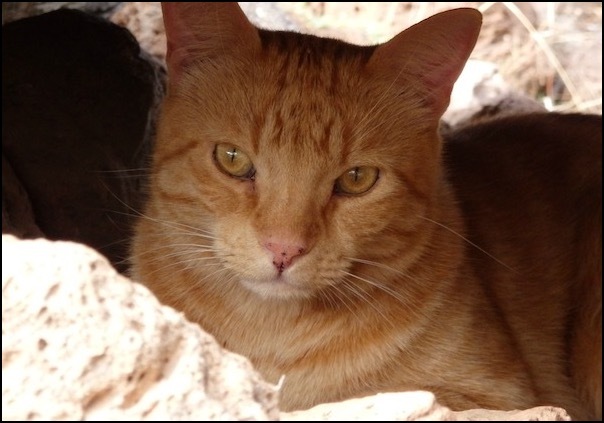 Jerry had gone back spiritually to Sherman (my former orange tabby master wizard (October 30, 2018 blog). Jerry was one of Sherman’s “soul sprouts” or emissaries. Sherman said Jerry had fulfilled his purpose on Earth after seeing Belinda through the end of her life. Sherman was taking care of Jerry now, who was adjusting and being very quiet. While Jerry caused a lot of trouble with our other cats, I loved him dearly and his deep sweetness underneath the assertive independence. He always had a strong need to be alone, have his own space, work things out for himself, and be free of restraint. Now he had it all. Ziggy and Lila spent extra time with me on my lap. They understood how sad I felt. They also understood it was right for Jerry. The house was so quiet. On December 12, Jerry communicated to me for the first time since his departure, telling me why he had to go. 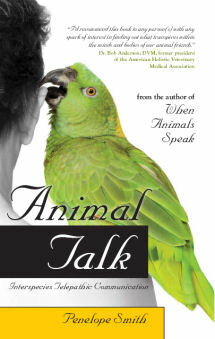 While he had been sent by Sherman to be with me and Belinda, all his life he felt like a caged lion pacing. He had to be out in the wild to feel balanced and grounded. After Belinda left, he felt he didn’t belong on Earth anymore. I felt such an undefinable tiredness, like lead weighting my body to the ground. At one point I even had an urge to lay prostrate on the ground trying to understand what the feeling was and I wondered if these sensations were even from me, from traveling or from someone else. Now in retrospect I wonder if I was feeling Jerry's departure, return to the earth and the weight and ache of your sadness. As the days went by, I felt Jerry spiritually expanding into the cosmos, united with Sherman and streaming golden-orange light all over the galaxy. It was sometimes hard to adjust to Jerry being gone so suddenly. I missed him with his loud, expressive voice calling to me as I called back. I was sorry he didn’t get to meet Belinda’s sweet successor, Pepito, adopted on December 20 (December 31, 2018 blog). On December 26 I had a vivid dream that Jerry returned home very wounded. In the dream, there were students at the house for a gathering and the wind was opening doors. I asked them to close the doors, but Jerry was gone. One student gave me a young African lion as a gift, and I returned it to her, saying that a lion did not belong in captivity. On January 4, 2019 just before 7 PM, I heard persistent meowing. It sounded like Lila was caught inside the pantry. Then I realized it was coming from outside the front door and wondered if Lila got out somehow. Pepito and Ziggy were the first to come to the door as I opened it. Jerry hissed as he started to come in and backed away outside. I put Pepito and Ziggy behind closed doors, then got Jerry inside and in the laundry room for safety. Jerry had a big scabbed-over gash and several oozing cuts with most of his hair gone on his swollen forehead. He eagerly ate a meal and soaked up my loving. Lila was surprised; she said she thought he was killed. So did I. Within twenty minutes of his return home, a pack of coyotes gathered outside the fence and sang madly. It was very unusual for them to gather there, especially at that time of night. They pictured Jerry. He who runs with coyotes. The next morning, our vet was amazed Jerry managed to live outside in our area for 4 weeks and do so well and she admired him for it. Jerry’s sweet charm shone through even in his battered state. He was 9.8 lbs, down from his usual 12. He’d been hunting rabbits and rodents quite well but living outdoors takes a lot of energy and wild animals are lean. The vet drained the infection and gave him a shot of antibiotics. That night Jerry told me he sent the pictures of his departure by coyotes as a possible scenario of leaving since he was very sad about Belinda and felt his purpose on Earth was done and also to let me believe he was killed. He did not want me to search for him. He also fooled Lila, and she could not search further for him, either, since I was now keeping the cats at home. He also showed me he had entanglements with a bobcat, causing the injuries to his face. His guiding lion spirits must have helped him get through those encounters. Besides the forehead gouges just above his eyes, there was not a scratch on his body. About 40 hours after Jerry showed up at the door, with his wounds now healing well and looking more relaxed and refreshed, I let him out of the laundry room. Pepito was the first to greet him. In a very short time, after I reminded Jerry that Pepito was his little dog friend who loved him, Jerry was purring and rubbing up against Pepito! He was fairly relaxed with Ziggy and Lila, too. Lila gave him tender loving licks. All was peaceful at our house with a day of winter rain, cleansing away old ways that no longer worked. Pepito, Lila, Jerry, and I had a welcome home nap together. Jerry talked to me about missing Belinda. I held him to my heart and asked him to feel her there. The house is very lively with Jerry’s vocalizing and activity. He has wanted lots of contact since his return, rubbing against my legs, and sitting on my lap purring as he enjoys deep massages. 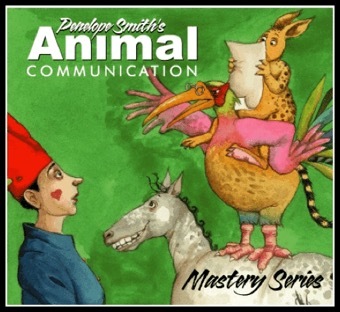 To communicate with your beloved animal family and wild animals and find out about their adventures, study the basic steps and how to further advance in animal communication.